Terracotta tiles are cleaned to remove moss and lichen. The tiles are made from natural clay, which is naturally moist, and moss and lichen are attracted to the roof tiles’ surface. If left, the moss and lichen will continue to grow, and will restrict the flow of rain water. When restoring terracotta tiles, your roofing professional will assess your roof for any damage, and replace tiles where necessary, using a similar type of tile. The main aim is to restore the tiles, and not change the existing roof design. 1. The roof is assessed for damage. 2. The next step is to apply an anti-fungal solution to the tiles, to kill algae and fungi, and to remove lichen and moss. This will inhibit further regrowth of lichen, moss, and fungus, and will ensure your tiles remain strong and intact. This is obviously an important part of the process. 3. And now for the cleaning process, through high-pressure water cleaning over the entire roof, from top to bottom. This will remove all dirt and fungus. All surrounding gutters and external walls and paths which have been affected by the grime off the roof will need to be cleaned. At this stage any other necessary repairs are done, such as rusty valley irons removed and replaced, as well as flashings, battens etc. which need repairing or replacing. 4. Next is the re-bedding. Roof bedding is a strong cement mortar that holds the roof tiles in place. (Over time the bedding is subjected to natural wear and tear, which cannot be avoided, therefore loosening the tiles, which need to re-bedded.) When all the replacement tiles are in position, the existing ridge capping tiles and gable end verge tiles are now stripped and replaced where needed and are re-bedded where required, removing old mortars on the roof. Loose tiles are a common sign that the roof needs re-bedding. If bedding is left to deteriorate it may crack or fall away completely, dislodging the tiles and leaving the house vulnerable to the weather – not to mention the danger of tiles sliding off the roof and landing on someone! 5. The entire roof now needs re-pointing. Flexible pointing expands and contracts with changing weather conditions. If your pointing has cracked or deteriorated, your roof is more likely to leak – and this will cause damage to your home. Flexible roof pointing has been used in Australia since 1995. If your roof does not have flexible pointing, it is strongly recommended that it be re-pointed. Roofing professionals generally recommend that your roof will be re-pointed at least once every 10 years. 6. Your roof is now ready for re-sealing/coating/painting. Talk to your roofing professionals about choices available to suit your needs. Warning: If terracotta roofing tiles have been glazed, they should not be re-sealed, coated or painted when restoring the tiles, as there will be problems with adhesion. Old terracotta roof tiles will become brittle over time, and if they do they should not be cleaned, as the tiles may break underfoot, causing water to enter the roof cavity. It is also difficult – and dangerous – to walk on, and work with, brittle roof tiles. 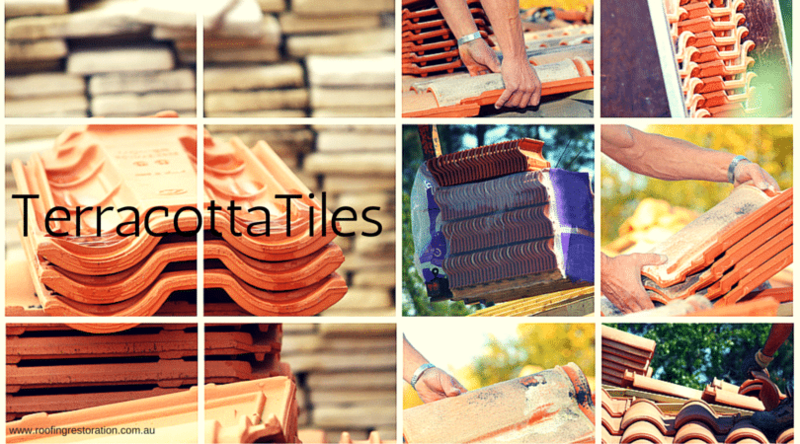 Brittle terracotta roof tiles should be replaced, in order to prevent problems which can be avoided. Contact us at Rooftec Roof Painting and Restoration – your Newcastle and Central Coast Roofing Specialist – on (02) 4944 2010 – or complete your details on our Home page, for a free quote. Our roofing experts will assess the current damage of your roofing and will identify all breakages, dents, dirt, or anything causing leakage, rust and other elements that weaken your roofing material. Our main objective is to restore your roof, and not to alter the existing roof design and system. Remember – we have over 25 years’ experience in Newcastle and the Hunter Valley, and all our work is backed by a 10-year guarantee!